This post is dedicated to Ante Pernar, a beloved figure on the island of Pag, who passed away last year. It was summer, and Ante had a cold. As his Jeep rumbled down the barren, rocky hill, patches of Adriatic Sea shimmered and winked in the distance. We descended from a high plateau on the moonscape island of Pag—Croatia’s most indented island—famous for Paški sir, it’s unique, award-winning sheep’s milk cheese. 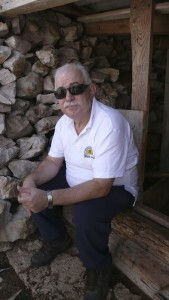 Ante had retired from his position as CEO of Paška Sirana, the largest cheese factory on the island. After feeding his flock of sheep, it was time for Ante to return home and rest. His daughter, Martina, told him to stop so she could pick some fresh sage for his tea. Known for its medicinal properties, sage is a common herb found in popular Croatian dishes—including the sauce for needle macaroni. 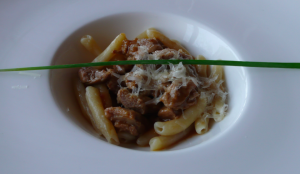 Makaruni na iglu (“macaroni on the needle”) is a popular dish in Dalmatia and on Pag, a northern Dalmatian island. It is made for special occasions like Easter and weddings. Pasta, one of Italy’s gifts to Croatia during a 600-year-long rule, plays a starring role in Dalmatian coastal cuisine. In Italy, maccheroni used to be made by wrapping pasta dough around knitting needles—the same way it is made on Pag today. If you visit the island of Pag, you can sample this domestic specialty at the restaurants listed below. You can also make this delicious dish in the comfort of your own home. Recipe for Konoba Giardin’s needle macaroni.